Yep, today it my birthday, so instead of a regular cartoon, I pretty much just drew myself a birthday card! 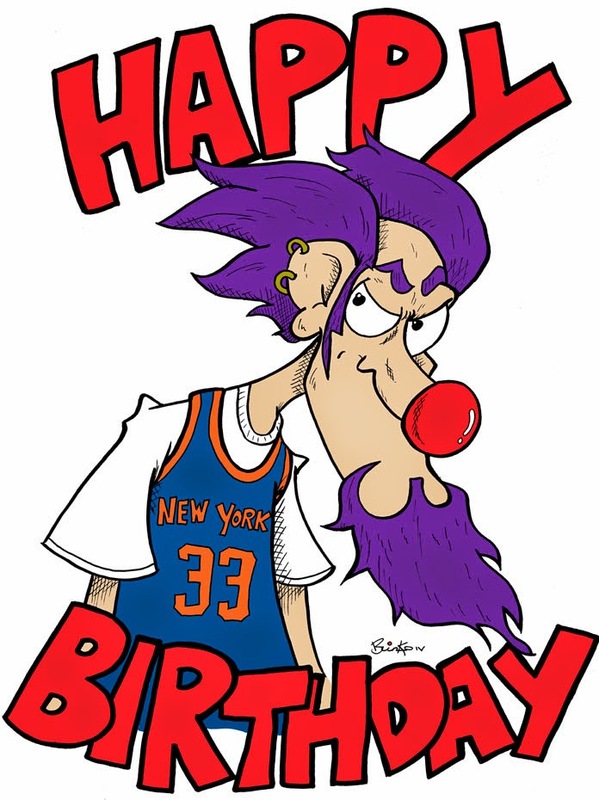 Featuring my psychotic clown character, Engelbert wearing the very New York Knicks jersey that I got myself for my birthday today….kind of. I won some vouchers at a sports store that was the exact amount of an NBA jersey and I’ve been meaning to get a Knicks one for ages now, so I got it and gave it to myself for my birthday. That’s not weird is it? And it’s even sweeter that it’s Patrick Ewing’s jersey as well, the man is a Knicks legend. So Happy Birthday to me! I think I’ve going to try and sneak some Knicks jersey’s into my regular cartoons now, why the hell not?